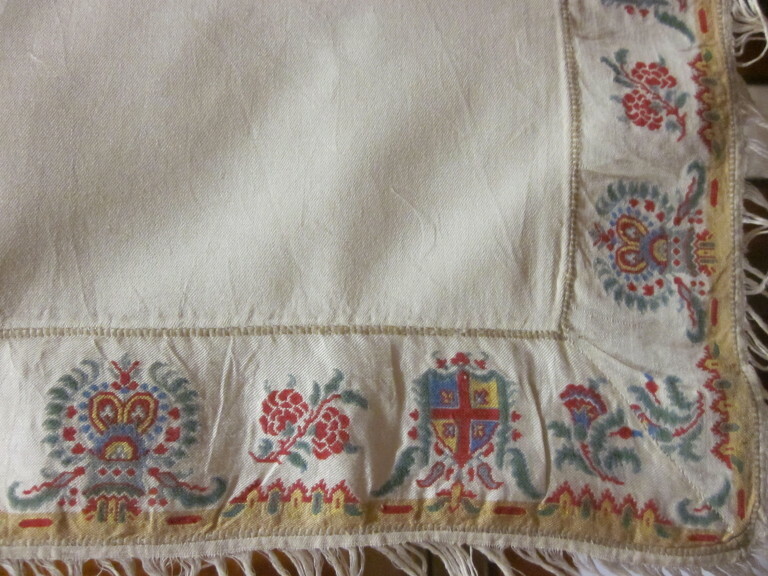 Square shawl with a plain woven silk and wool centre.The border is woven with a pattern of heraldic motifs which are probably a product of the nineteenth century interest in chivalry. The design is woven in yellow silk and green, red and blue wool. Two adjacent sides of the border are sewn one way and the other two in reverse. The borders are hand-stitched onto the plain centre. 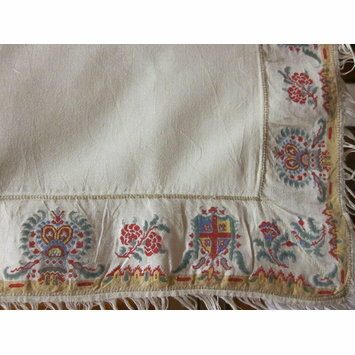 Historical significance: This is a fine example of a turnover shawl and probably dates from the early 1830s. It is important as we have few examples of shawls of this type in the collection. The heraldic motifs are particularly interesting and are probably a product of nineteenth century chivalry. They are a similar colour and design to some of the motifs on the Eglinton Tournament waistcoat T.129-1969. The shawl would have been folded and worn over the shoulders fucntioning as a light wrap inside or out of doors. The fact that the borders are sewn onto two opposite sides of the shawl means that when it is folded the four borders are arranged in a chevron down the wearer's back. British shawl borders were sewn on by hand until the 1840s when they were made on a handloom in one piece. The colours are typical of fashionable shawls of the period and may have complemented the colours of the dress.